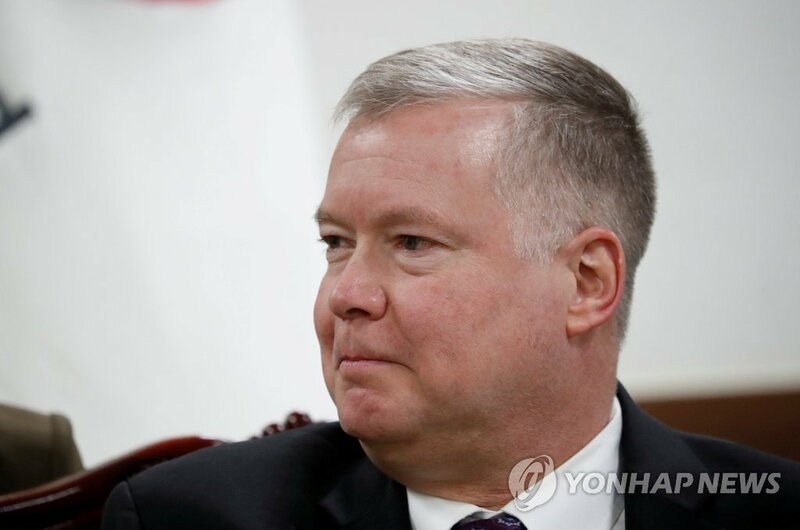 WASHINGTON, March 11 (Yonhap) -- The United States remains open to talking to North Korea despite the breakdown of last month's summit and will push to seal a denuclearization deal while keeping sanctions in place, a top U.S. negotiator said Monday. U.S. Special Representative for North Korea Stephen Biegun, who is in charge of day-to-day negotiations with Pyongyang, made clear that the U.S. seeks the elimination of all weapons of mass destruction in the North, not just nuclear weapons. But he said he is "confident we can get there" over time as the consequence of failure would be "huge" for both sides. "Diplomacy is still very much alive," Biegun said in a nuclear conference hosted by the Carnegie Endowment for International Peace think tank. "We stay closely engaged." Neither side has acknowledged any communication since U.S. President Donald Trump and North Korean leader Kim Jong-un came away from their second summit in Hanoi, Vietnam, on Feb. 27 and 28 with no deal in hand. The breakdown was attributed to differences over the scope of North Korea's denuclearization and sanctions relief from the U.S.
"We are not going to do denuclearization incrementally," Biegun said. "We need a total solution." Trump said during a post-summit press conference that the North had asked for the lifting of all sanctions in return for the dismantlement of its main nuclear facility in Yongbyon, and that the U.S. needed more than that. The North Koreans retorted they had sought removal of only those sanctions affecting people's livelihoods, a claim later characterized by a U.S. official as a "parsing" of words. Trump "doesn't desire to impose or sustain sanctions against North Korea," Biegun said. "He'd like to have us in a position where we can lift them, but we have to get the North Koreans to begin that process of denuclearization." He said the removal of sanctions now would amount to "subsidizing" the North's ongoing development of WMD. He added that until the process of denuclearization is complete, the U.S. will not remove sanctions. Biegun asserted that the Trump administration's vision is "much bigger" than just denuclearization and includes the other commitments the two leaders made at their first summit in Singapore in June. The U.S. seeks to transform relations with the North, he said, advance a permanent peace regime on the Korean Peninsula, and secure the remains of all American troops killed in the 1950-53 Korean War. "They're all proceeding in parallel ... but as is so often the case, nothing can be agreed until everything's agreed," Biegun said. "That's not to say that we can't take steps to build confidence between the two countries, but the foundation of this policy is denuclearization. And until we can get to some point where we have the same traction on that issue that we have in the other issues, that makes it very difficult for us to move forward." In the case of Yongbyon, Biegun said, the North Koreans have had a "shifting" definition of what that complex entails. This demonstrates the importance of getting a complete declaration of the country's WMD program, he said. The Trump administration has said it aims to achieve North Korea's denuclearization before the end of its current term in early 2021. "We stand by the expectation that if we fully mobilized our resources, and if we worked with the North Koreans and not had to do this over their objection, that we could align our ourselves in a manner sufficient to achieve this in something approaching a year," Biegun said. The missing variable, he said, is that the North Koreans have to be "similarly bought into that objective." Biegun was cautious to interpret the recent reports of increased activity at North Korea's missile facilities following the summit. "I don't know what message they are trying to send," he said. "We certainly have sent our message loudly and clearly from the president of the United States that we would not think that that would be a productive step for them to test a rocket or missile."